Does anybody remember way back when I posted a copycat recipe for Panera’s Steak & White Cheddar Panini? I mentioned I already had a “go-to” sandwich, but I followed my friend’s lead and ordered the steak one. My “go-to” was Panera’s Turkey Artichoke Panini. When I was out with my friend I didn’t realize it was no longer on the menu, which is a good thing because I swear I had to grieve alone when I found out. I can get fixated one a particular item at a restaurant. If I order it and love it I’ll always get the same thing every time I visit and for me, it was the Panera’s Turkey Artichoke Panini. And I’m not the only one fixated. There’s a Facebook page entitled Bring Back the Original Turkey Artichoke Panini! Luckily, Panera’s Turkey Artichoke Panini is pretty easy to make at home. Maybe I should qualify that. Pretty easy to make at home if your hand isn’t messed up! Luckily, my son’s dear girlfriend, Tweety, stopped by and helped me out. She shoveled for me, changed my sheets, got down my winter clothes, ran things from floor to floor, and did a lot of heavy lifting for me, bless her heart! And she pulled out my little Cuisinart grill so we could make Panera’s Turkey Artichoke Paninis. By the way, if you have some kind of grill or press, that’s great and if you don’t, I’ve got a workaround. 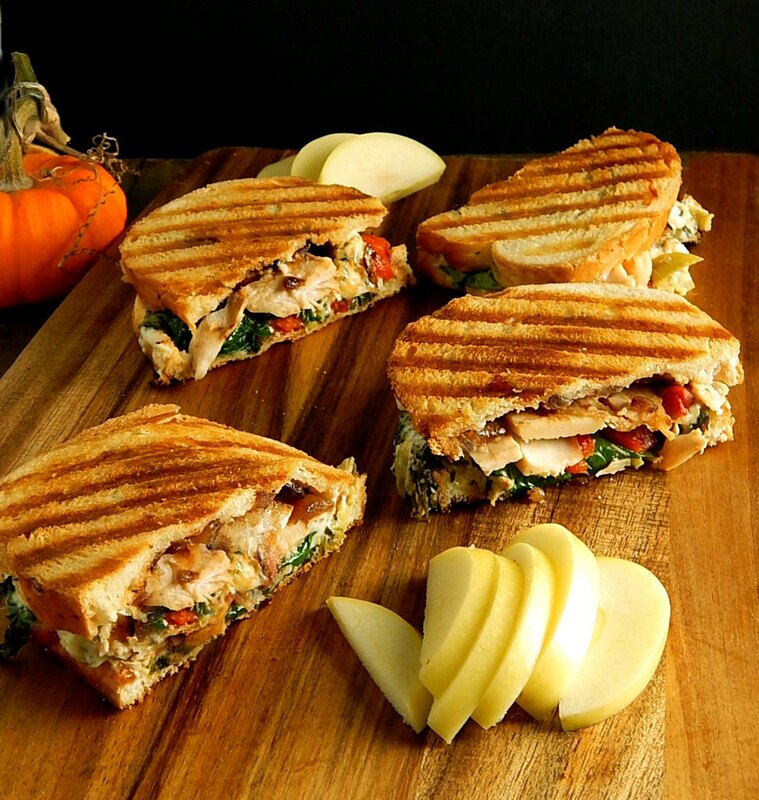 What makes Panera’s Turkey Artichoke Panini so good is the blend of all the flavors. There’s turkey so it’s a great leftover Thanksgiving turkey recipe, some caramelized onions, and roasted red pepper, a little fresh spinach and then there’s the artichoke spread. I remember it being a little heavy on the basil. And when heated it all melds into one delicious, flavorful, ooey, gooey melted sandwich. It’s heavenly! And what makes them easy is starting with a Spinach Artichoke Dip that’s homemade or storebought. It’s hard to make just a little Spinach Artichoke Dip, so this is a great use for any leftover. Or if you’re making Spinach Artichoke Dip for a party or gathering, sneak enough out to make your Panera’s Turkey Artichoke Panini. I honestly don’t remember the spinach part of the artichoke spread in the actual Panera sandwich, but it really is close enough. I know, because it’s my favorite sandwich. I might have to join that facebook page! So we just covered the Spinach Artichoke Dip, so let’s talk about the other components. The caramelized red onion is super easy and they can cook up as you pull everything else together. Then there’s the roasted red pepper. You can buy that at the store in jars, usually in the Italian section, or make your own, which is a lot cheaper. I find quartering the red bell pepper, laying it out on foil (turn the edges of the foil up to create a little pan) and broiling it makes it fast and easy with no need to babysit so much and continually turn. When it’s charred, I just fold the foil around it and let it steam, open and peel right on the foil and all the mess is contained. The spinach is great on the sandwich, the only fresh component, but honestly with all the spinach in the artichoke dip is a little redundant. I wouldn’t sweat it if I didn’t have it on hand – one note of warning, wash your spinach or any salad greens well under running water. Even if the bag says they’re already washed. If you have a little fresh basil, I highly recommend adding a little to the sandwich. My Hot Spinach Artichoke Dip is heavy on the basil but I still think a touch of fresh basil would have upped my game on this sandwich! Panera made their sandwiches on an herbed focaccia bread; I just used plain old Italian bread. Use what your budget, tastes and time allows. You can actually buy the bread at Panera if you want. Now if you have some type of indoor grill, grill pan or panini press, you’re home free. If you don’t, make these just like you would grilled cheese in a pan or a griddle, but butter only the bottom and weigh them down with something heavier. If you have your sandwiches all on a griddle, put a small sheet pan over them and add a soup or other can over each sandwich. If you are cooking in a pan, a plate or another small skillet (make sure the bottom where it will be in contact with the sandwich is clean) will work, too. Again, add a little weight. Then butter the top, turn and repeat the same weighing procedure. A note on using the Cuisinart Griddler: My initial sandwiches actually looked even better. I had preheated the grill to as high as it would go, then turned it down and cooked them slowly. When I remade the sandwiches for the photos, I didn’t do that and cooked them on high until done and they weren’t quite as crispy crunchy golden brown. I’m going to remember that for my next paninis. Panera always made their Panera’s Turkey Artichoke Panini in what I thought was a strange way. They’d make the paninis then wrap them and hold them in a steamer. So can get the same effect and have a mess-free sandwich by wrapping yours in wax paper. Saveur has a little tutorial. It is, of course, going to be cheaper to use your own Hot Spinach Artichoke Dip than to buy it but if you just really only want enough for the sandwich, you can generally find small packages in the deli section and depending on your store, sometimes you can buy just what you need. How much to use in the sandwiches is a bit variable. I thought about a generous quarter cup was just about right. That makes it about 8 ounces or about a cup of dip. The turkey for the sandwiches is more of a “hand carved” turkey than thin slices, and making these sandwiches with leftover turkey is a considerable savings over buying turkey at the deli. Chicken will be good, too, and might be a great cheaper, easier to do at home option if you don’t happen to have a turkey laying around. And while jars of roasted red pepper are notoriously pricey, making your own is fast and easy and won’t break the bank, especially if your peppers are on sale. When bell peppers are on sale, I like to buy enough for what I need in the current week and a couple for next week’s cooking. They keep well for a week or so. Heat a small heavy pan over medium-high heat. Add butter, onions, and sugar and cook, stirring often, until onions have softened and picked up color, eight to 20 minutes. Stir often, especially at the end of the cooking time. Place a generous amount of foil on a sheet tray, enough foil to fold over the bell peppers and crimp tightly. Add the bell pepper quarters in a line, turn the foil up a bit on the edges to contain any juices. Broil about four inches below the broiler until the skin is charred and blistered. Remove from oven, fold foil over the peppers and leave to steam for several minutes. Open packet carefully, peel peppers and slice peppers into strips. Lay out the bottom slices of bread. Spread each slice with 1/4 of the mayonnaise, add 1/4 of the caramelized onions, 1/4 of the turkey. Top the turkey with 1/4 of the roasted red bell peppers, 1/4 of the spinach artichoke dip, a little fresh basil, optional, a few spinach leaves and top each sandwich with the corresponding bread slice. Butter the tops of all the panini, add to the press or grill buttered side down. Butter the top side and close the press or grill. Close and turn heat down to medium and continue to cook until golden brown and crunchy and spinach artichoke dip is melted. I’ll be sharing my Panera’s Turkey Artichoke Panini at Fiesta Friday #252, and the co-hosts this week are Alex @ Turks Who Eat and Zeba @ Food For The Soul. Stop by and check out Fiesta Friday and Alex and Zeba’s sites; you’ll love them all! This entry was posted in Click here for Fabulous Food Posts and tagged Artichokes, Bread, hot spinach artichoke dip, leftover turkey, panera, Sandwiches, Spinach, Turkey. Bookmark the permalink. Feeling hungry just looking at this one. Thanks! They are a bit unusual, I think but I do love them.